“That chubby German broad who has the big job over there in Germany there is 100% right about what she’s saying about those illegal aliens and invaders,” said hard-bitten contractor Charlie Nornaway, from his home in Wilkes-Barre, Pennsylvania USA. Nornaway, a German-American, pretty much echoes the sentiment of about every normal person in the world — but about 40% will not admit it because they are too busy worrying about Chuck Norris’ toupee. 50% of people in a Rasmussen poll said that Chuck’s wig is what kept them from buying a home fitness center and of these 50%, nearly 98% said that the nicer countries in Europe were being ruined by veil-wearing invaders. This poll reflects a new generation of polls where two seemingly unrelated things are brought together to prove that everything is connected. Angela Merkel shocked the world with her remarkably candid remarks about how Muslims in her country serve no purpose other that to sell fruit. She implied that they don’t integrate into German society; preferring instead to create their own dirty communities — like the Chinese have been doing in the USA for centuries — but the Chinese don’t blow people up and smell like rotten garlic and cumin. Merkel’s most shocking comments were saved for action-cheapo-TV star Chuck Norris. She blames him for the influx of Muslims and says that if he stopped wearing that stupid wig, solid European people and Americans, would be more motivated to keep their countries free of garbage. Merkel threatens to come to the USA and rip the wig off of Norris herself if she gets approval from her government. 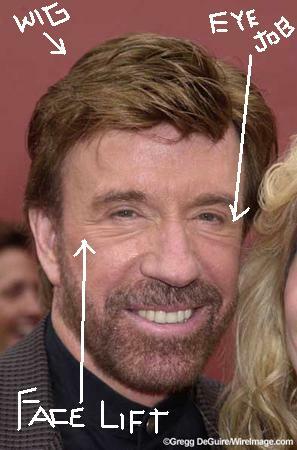 In a report issued by Chuck Norris’ press agent, nChuck Norris said that he would gradually take off the wig in the next few months but would put it back on to back Mike Huckabee in the 2012 Presidential election. You neglected to point an arrow to his $60,000 set of porcelain veneer teeth.